"Austerity is the new normal. It is not a temporary phenomenon. It will become permanent. Fiscal conservatism is the order of the day." See the way he emphasises his point using short sentences? It's classic Blair era communication training; used to signify authority, gravitas and confidence. The less generous among you might dismiss this Dalek-like grammar as pompous, hubristic and rhetorical. It is. There is a new consensus. Milburn is part of it. It is permanently wrong. However it is powerful, and unites the Tories, the Orange Book Lib Dems and the New Labour factions. Under the not-quite-leadership of Ed Miliband, Labour has at times seemed to embrace this consensus, but at other times hinted at breaking away from it. 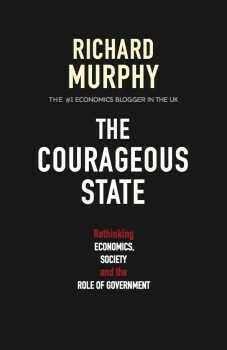 "The truth is this: the era of big public spending is over ... The implications for public spending of a more constrained fiscal environment are threefold. First, governments will be forced to choose between spending programmes as well as within them. Second, they will have to think in a new way about how to get better value from existing programmes. And third, Europe's largely tentative efforts to reform welfare and public-service provision will have to move up a gear"
There is no alternative. But why? Milburn doesn't say. But the reason is the unspoken consensus: that rather than find a new economic structure we must slash wages in a race to the bottom to compete with the autocratic union-busting state capitalism of China. So inequality is here to stay, even if Milburn laments it "How to address growing inequality?" briefly, before moving swiftly on to more important questions, like "How to create wealth and reward it?" The question of how to create wealth is an interesting one. Banks do it by issuing credit (making loans) on which they charge interest. Now maybe if the state did that? For instance China's post-economic stimulus meant an expansion of public bank credit going to companies set up by local governments to help fund infrastructure investment. Combining economic controls with trade union rights, civil liberties and democracy is no contradiction - despite the fact both China and the UK fail to do it. But what Milburn wants to debate is not whether we can control credit or our currency, or redistribute the wealth we all create. No, Milburn's article is about how to privatise the NHS as a solution. So much for the Big Society. 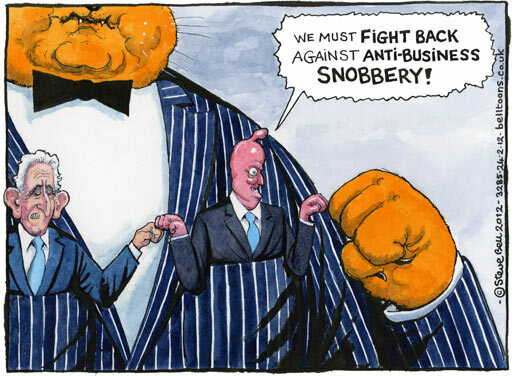 David Cameron came out swinging yesterday with uncharacteristic passion for big business, not the big society. Having flirted with 'moral capitalism' (whatever that means), Cameron said he was "sick" of "the snobbery that says business has no inherent moral worth like the state does". "Big business has been rightly pilloried of late for dodging taxes, paying excessive bonuses, rampant profiteering, and now exploiting the unemployed through workfare. "Cameron's speech is a reaction to the inevitable public distrust and growing anger with his government handing over our schools, welfare system and the NHS to big business. "Activists should be proud that we have forced the government on the defensive - and keep up the pressure!" By contrast, David Cameron called on "those of us who believe in markets, business and enterprise" to "fight this mood with all we've got." Twitter and Facebook have proved effective at both naming and shaming abuses, and are in organising high street protests. Even the Daily Mail and Telegraph have published articles critical of mandatory forced labour. Cameron's words mean we can expect a concerted onslaught from the governing parties and the old media - mostly reliant on corporate advertising or donations - to convince us that big corporations are rather benevolent institutions. Don't expect Cameron to be writing this charter into corporate law any time soon. Unemployment rose by 48,000 in the past three months to 2.67 million, the economy managed only 0.3% growth in the past year, and Osborne is having to borrow far more than he planned - not to invest in the economy, but just to service debt. Keynes made that statement in the 1930s when politicians were heading in completely the wrong direction under Ramsay MacDonald's national government. Reducing unemployment is the key to closing the deficit and reducing Britain's mounting debts. More people in work means more taxes coming to Treasury coffers, and less being paid out in benefits (not just the pitifully low jobseeker's allowance, but in housing benefit and other reliefs). More people in work means more disposable income in the economy to help sustain jobs in the service and retail sectors. This will keep more people in work in those areas and would give businesses the confident to invest; creating more jobs. There's also the added bonus of extra VAT revenues too (a virtuous circle you might say). The right will be quick to jump on the Keynesian analysis - and ask how will all these new jobs be funded? The simple answer is by borrowing. The knuckle-dragging morons of the right will then glibly quip 'oh so your solution to a debt crisis is to borrow more'. This is your chance to quip back 'yes, like George Osborne is - an extra £46bn in fact, because your stupid way doesn't work'. What would £46bn fund? Well crudely over 1.8m jobs paying £25,000 (which would in turn give back billions in tax revenue). Instead of this Keynesian approach, Osborne is following the Thatcherite monetarist approach. Osborne also recognises that welfare costs will rise when unemployment is high, but his solution is cutting £20bn from welfare over four years. This is attacking the victims of the economic crisis. Workfare is a particularly vile element of this 'welfare reform', in which claimants are offered, or forced onto, placements in large corporations to work near full-time hours for free. This benefits the profit margins of the companies, but does not create jobs. In fact given there are to be at least 250,000 of these placements then it is fair to assume that some job substitution will go on, and that it will have some effect in suppressing wages. While 2.67 million people are unemployed, there are only 476,000 vacancies in the economy. The TUC has done valuable work showing that actually there are as many as 6.3 million people looking for work, by applying the US U6 model to the UK - and those just wanting to change jobs. Are workfare placements included in the vacancies figures? More worrying still is that some of the 476,000 vacancies, the ONS cites, might actually be unpaid work placements. Following the emergence of a Tesco ad for night shift workers on 'JSA+Expenses', LEAP asked the ONS 'do the 476,000 vacancies in the Labour Market Survey data include unpaid work placements through DWP work experience schemes?' The reply was underwhelming: 'It is unlikely to be included as businesses are asked how many people they are looking to recruit from outside their business'. 'unlikely' is not the reassurance we wanted, but the rest of the message is worse - workfare placements are recruited from outside the business as the numerous workfare ads now emerging in Jobcentres prove. The DWP's own research has found that "workfare is least effective in getting people into jobs in weak labour markets where unemployment is high" (so like now then), and further adds "schemes that pay a wage can be more effective in raising employment than 'work for benefit' programmes". For 16-24 year olds - 22.2% of whom are unemployed and who make up around 40% of all the unemployed - the Work Experience Programme offers the opportunity to experience slave labour in a modern setting. Now, some people have criticised groups for calling workfare, 'slave labour', and they're right: slave labour was often provided with food and tied housing. Many of us point to the 1930s and Keynes because he was arguing against a political consensus of idiots who were wrecking the economy and with it millions of lives. Many of us have argued that this government is winding back the clock to the same period - ripping up the post-war welfare state. Now with the reintroduction of slave labour, it is clear the Tories and Liberals want to go back even further to the early 19th century - a time when slavery had only relatively recently been made illegal. But even then the Tories didn't argue for its restoration. As the Greek public order minister says his people "can't take any more", it's timely that Simon Jenkins (Austerity fails, yet we're too shy to think outside the box, 15 February) says the failure to take economic management beyond the diktats of austerity has become the great intellectual treason of today. It is not just in Greece that austerity is failing but in the UK, too. George Osborne's emergency budget was supposed to bring Britain back from the brink but has, instead, pushed us closer to the precipice. Where he predicted growth of 2.3% last year, we got 0.3% – less than in the US, Germany, France, and even Italy where their leader's economic incompetence got him deposed. This failure to generate growth – which Osborne pledged to create by cutting the public sector, which he said had been "crowding out" the private sector – means his government is borrowing billions more than planned, necessitating further cuts. Unemployment is the highest for a generation, with youth unemployment the highest ever on record. The alternative required is the exact opposite of austerity; it is investing for growth, creating jobs to get people working again, and raising wages and benefits to create demand. We have distributed over 250,000 copies of our "There is an alternative" pamphlet, explaining how this would work. Even the modest stimulus in the US has meant falling unemployment and higher growth. Mr Osborne should at least aspire to that, rather than following Greece into a death spiral. • Simon Jenkins rightly wails that "thousands of citizens across Europe are having their lives ruined ... because a financial elite, once burned, is too shy to think out of its box". Fair enough, but maybe part of the problem is that the Guardian, like most of the media elite, is itself too shy to publish outside the box. With the unemployment trajectory on course this week for 3 million by the end of the year, it is remarkable that the renowned policy analyst Peter Taylor-Gooby was not even mentioned when he recently published his research study linking the potential for civil disorder and riots to the legitimacy of the austerity measures taken by western governments over two decades and suggesting that without change further unrest will follow. Similarly, when tackling the economic deficit Greg Philo offers a radical proposal of a wealth tax of 20% on the assets of the richest 10%, but his work never gets beyond the Guardian's website. There's a comforting staleness in reading the same old establishment faces in the Guardian and watching them on Question Time or the Politics Show. Exceptions apart, to have a Guardian journalist decry others for a lack of radical thinking when the paper has been a fervent advocate of the timidity of British politics is a bit rich. There is a very simple way to deal with the bankers' "bonus culture" that nobody seems to be talking about. Tax it! In the 1970s, for taxable incomes over £20,000 (equivalent to around £170,000 now) we had a tax rate of 83 per cent. On "investment" income (that is from gambling on the capital markets) it was 98 per cent. If employers really think their executives are worth it, let them pay these obscene bonuses, but let us at least tax them so that the rest of us, upon whom their businesses depend, will get a cut in the form of more money for public services. Of course, there is no way that this government will take such a step, but that does not mean we should not talk about it. Of course, if we had a government that took such a measure there would be the usual cry that all these fantastic "experts" will migrate. Good riddance, I say. Nobody is indispensible. There will be always be people who can grow into the jobs that need to be done, who will not demand bonuses for the jobs that they are already being paid to do.